…Ex-govs urge calm over separatist agitations By Chioma Gabriel, Anayo Okoli, Ugochukwu Alaribe & Chimaobi Nwaiwu UMUAHIA—THE leader of the Indigenous People of Biafra, IPOB, Mazi Nnamdi Kanu, yesterday, disclosed that the Federal Government offered him Biafra Republic while in Prison with only the five South East States as the component parts but he rejected it. According to him, he rejected it because that did not constitute the complete Biafra, saying that he told them that he wanted a Biafra with Rivers and Benue States inclusive. 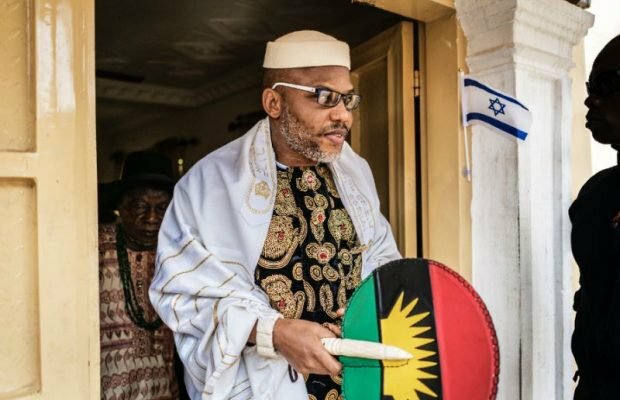 The IPOB leader also claimed that he was offered an oil block and mansion in Dubai aimed at making him to abandon the cause but that he rejected them and insisted on the actualization of Biafra. the forum called for calm. “No sacrifice is too much to avert chaos, prevent any further incidence of criminality, protect human lives and spare the lives of the country,” the forum noted. They also urged Acting President Yemi Osinbajo to convene a joint meeting of the various patrons of the contending groups in which assurances could be given. “The elders and leaders of thought from both the South East and the North should jointly meet to state a common position; we further recommend that traditional rulers from the two areas should do same,” the ex-governors said. The meeting of the past governors was attended by Obong Victor Attah, James Ibori and Isa Yuguda, among others. If restructuring fails, we’ go for referendum— Ohanaeze But reacting through its National Deputy Publicity Secretary, Ohanaeze Ndigbo said its position on restructuring Nigeria is clear. “We don’t are not talking about IPOB. Our position has been clear all these while. Nigeria needs restructuring now. But if restructuring fails, then we will talk about referendum. We have realised that many people have been saying many things and some are claiming to be Ohanaeze. But our position is very clear. Restructure Nigeria now or deal with referendum.” Presidency sources however would not react to Nnamdi Kanu’s claims when Vanguard contacted them yesterday , saying they don’t want to dignify the IPOB leader with a reaction over his claims.